Hermann, also known by his Latin name of Arminius, was born in 18 or 17 BC. He was the son of the Cheruscan chief, Segimerus, and trained as a Roman military commander. He had lived in Rome as a hostage in his youth, where he had received a military education, and obtained Roman citizenship as well as the status of equestrian (petty noble). Around the year 4 AD, Arminius assumed command of a Cheruscan detachment of Roman auxiliary forces. He returned to northern Germania in 7 or 8 AD, where the Roman Empire was seeking to extend its control eastward under Publius Quinctilius Varus, a high-ranking administrative official appointed by Augustus as governor. There he began plotting to unite various Germanic tribes to thwart Roman efforts to incorporate their lands into the empire. In the fall of 9 AD, the 25-year-old Arminius brought Varus a report of rebellion in northern Germany. He persuaded Varus to divert the three legions under his command (composed of the 17th, 18th and 19th legions, plus three cavalry detachments and six cohorts of auxiliaries) to suppress the rebellion. Varus and his legions marched right into the trap Arminius had set for them near Kalkriese. History would call it the Battle of the Teutoburg Forest. Arminius' success in destroying three entire legions and driving the Romans out of Germany was one of the most devastating defeats Rome suffered in its history, and a high point of Germanic power for centuries. "Arminius" is probably a Latinized version of the Germanic Irmin meaning "great." In the 19th century the name "Hermann" (meaning "soldier", "army man" or "warrior") came into use as the German equivalent of Arminius and he became an emblem of the revival of German nationalism. On July 20, 1840, Dr. Philip Merkel, George Heiner, John Blatz, A. Auer, R. Schwendel, W. Kohler and Philipp Germann gathered on the Lower East Side of New York and founded Der Orden der Hermann Soehne (The Order of the Sons of Hermann). It was an offshoot of the Odd Fellows and the first fraternal society in the nation. It would grow to provide mutual aid and promote the preservation of the German language and traditions. Although the order would have a female auxiliary called the Daughters of Hermann, Hermann Sons was for German men who were invited to join. It was more than a social organization. Either ignored or victimized by commercial insurers of the day, members found another way to provide a small measure of financial security for themselves. It became common practice to pass a hat, gathering contributions to aid the family communities of deceased members. 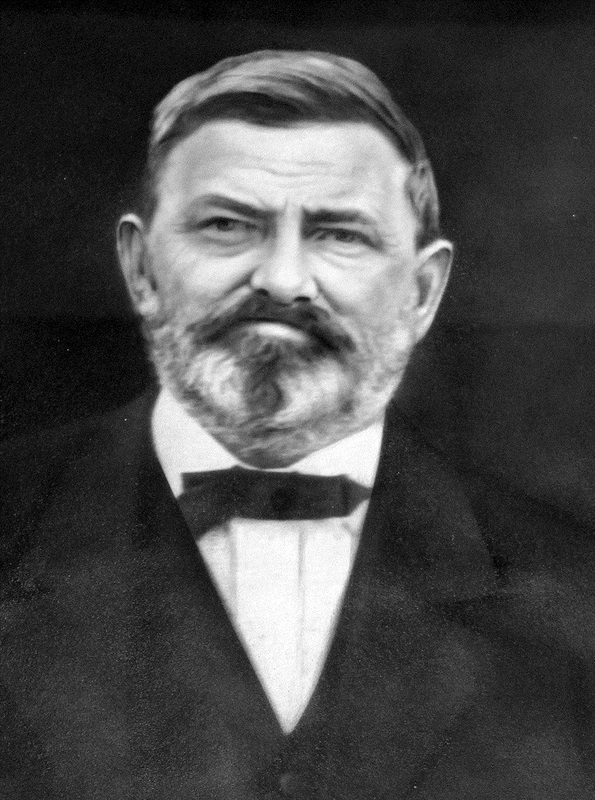 The Hermann Sons movement was introduced to Texans when John Lemnitzer, a member of Genesee Lodge No. 10 of Rochester, New York, with Jakob Goll, another member of the Order, took up residence in San Antonio. Lemnitzer and Goll assembled a number of German-speaking citizens of the Alamo City on New Year’s Day, 1860, and talked about Hermann Sons. 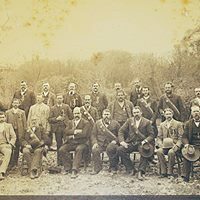 John Lemnitzer and Jakob Goll assembled a group of citizens in San Antonio that voted to organize a lodge, and on July 6, 1861 the first Sons of Hermann lodge in Texas was founded as San Antonio Harmonia Lodge of the Order of the Sons of Hermann. Five new members joined within the next few months. New members were recommended by current members. German ancestry was very much a prerequisite of membership as this was their common bond and all meetings were held in the German language. New members were accepted or rejected by vote. A ballot box was passed around to members at the meeting. Members would put a white ball (marble) in the box to accept the new member or a black ball to reject. It was from this voting system where the term blackball (to vote against; to exclude from membership by casting a negative vote; to exclude socially) originated. Judging from early meeting minutes, the pioneers of Harmonia Lodge organized as a brotherhood to be of assistance to each other. The first member death recorded was that of Heinrich Werner on Sept. 27, 1861, three months after the forming of the lodge. This prompted the first public notice of the lodge as 11 members attended the funeral in a group. Harmonia Lodge paid for both the coffin and the grave at a cost of $24. Records of the lodge indicate the widow received assistance from the lodge for a considerable time. 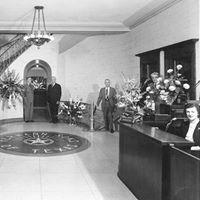 It was during a Harmonia Lodge meeting on Dec. 18, 1873 that connecting life insurance to lodge membership was first suggested. Harmonia Lodge asked the National Grand Lodge to institute a life insurance program and make the insurance obligatory for all members. The National Grand Lodge adopted the recommendation and announced on Sept. 22, 1876, that each brother would be entitled to $300 in life insurance and $60 at the death of his wife. In promoting this national project, Harmonia Lodge and Texas gained national stature. To boost membership, Harmonia Lodge instituted a system of paying its members $1 for each new member they brought into the lodge. On Jan. 16, 1890, the member solicitor, Anton Wenzel, arrived in San Antonio. Wenzel laid plans for a successful membership drive which would spread the Order across the state. On Feb. 2, 1890, almost three decades after the founding of Harmonia Lodge No. 1, the second Lodge, Eintracht Lodge No. 2, was established in Austin. Within the next two months, lodges were organized in Taylor, Waco, Temple, Brenham, Houston and La Grange, bringing the total number of lodges in the state to eight and total membership to 242. The National Order recognized the formation of a State Grand Lodge when at least seven lodges existed in any state. So on March 27, 1890, the Grand Lodge of Texas of the Sons of Hermann was founded. William Heuschkel of Harmonia Lodge was elected as the initial Grand State President of the Texas Group. Some 92 Hermann Sons lodges were established in communities throughout Texas during the ensuing year. In the early years, the Hermann Sons Office was located on Villita Street between Navarro and South Presa in a two-story rock building. The ground floor was the office and upstairs the various lodges held their meetings. 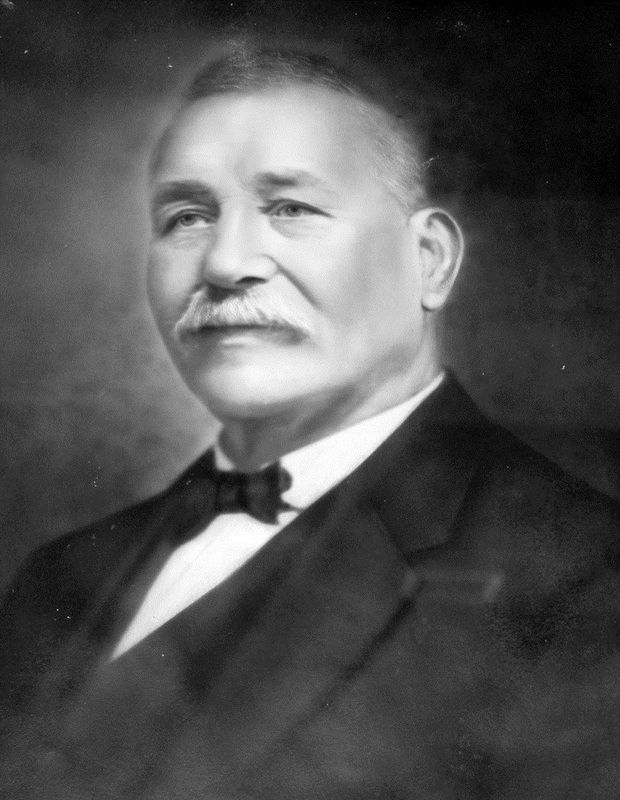 William Heuschkel was the first Grand President and held that position from 1890-1891. He was born in Germany and immigrated to the United States in 1859. At the time he was selected as the first Grand President, he worked as a teamster for the Alamo Cement Company. A teamster at that time was one who drove a wagon and team of horses, mules or oxen. He was a member of Harmonia Lodge No. 1. Wilhelm Leonard Heuschkel Sr. was born Nov. 6, 1841, in Kranchiborn, Sachen-Weimar, Germany, and immigrated to the United States in 1859.On Sept. 9, 1866, in San Antonio he married Eliza Anna Sasmanhausen (she had been born March 5, 1848, in Germany).They had eight children - Clara Ann, William Ludwig, Christian D., Elizabeth, Bertha, Ernestine, Emma and Herman Nicholas Albert. William worked as a teamster for the Alamo Cement Company in San Antonio.A teamster at that time was one who drove a wagon and team of horses, mules or oxen.He was a member of Hermann Sons Frederick Ludwig Jahn Lodge No. 172 and later transferred to Harmonia Lodge No. 1. 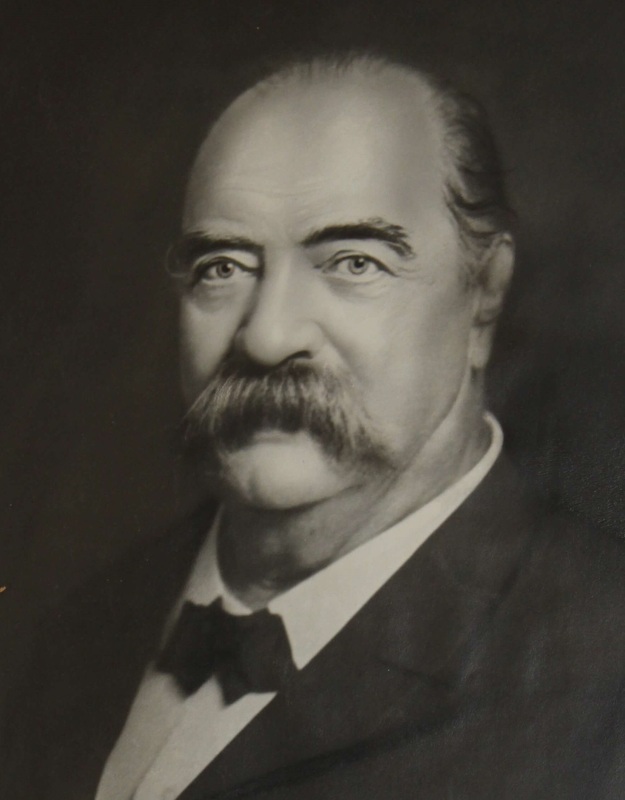 William served as the first Grand President for the Texas Hermann Sons from 1890 to 1891. Anna died Sept. 5, 1886, and is buried in the Hermann Sons Harmonia Lodge Cemetery in San Antonio. He married Clara Ann John (who had been born June 1866 in Germany) on April 23, 1892, in Floresville. Clara died just a few months later on Dec. 11, 1892. Around 1895, he then married Juliana Moeller Grundman (born Feb. 2, 1856, in Bohemia, Germany; died Jan. 7, 1936).Together they had one child, Hedwig Hanney Ackermann (born July 25, 1882; died Aug. 9, 1970).Her gravestone at San Fernando Cemetery No. 3 is in error.It states her year of birth as 1892, which is in conflict with a 1900 census.The same 1900 census states that William’s stepson, Paul Pentron (born 1886) also lived with the family. William died March 12, 1907, and is buried in the Hermann Sons Harmonia Lodge Cemetery in San Antonio. Friedrich Leopold (Julius) Schuetze, judge, German-language newspaper publisher and music teacher, was born in Dessau, Anhalt, Germany, on March 29, 1835. He was the son of Heinrich and Louise (Seelman) Schütze. He arrived at Indianola with his family on Nov. 2, 1852, on the ship, Diana. His brothers Louis and Adolf had preceded him to Texas. Julius lived in Yorktown and hauled freight between Indianola and other points. He also lived in Meyersville, where he founded the Texas Sängerbund, a German singing society, and in 1853 he participated in the first state Saengerfest held in New Braunfels. In 1854 he moved to San Antonio. There he taught speech and music and married Henrietta Heinz of Seguin, one of his music pupils. They had one child, Julia.In 1858 he moved to Austin, where he taught at the German School and tuned pianos.Schuetze tutored the children of Governors Sam Houston and Pendleton Murrah, studied law under Judge Wooldridge and was admitted to the bar. He was named a Texas Music Pioneer by the Texas State Music Office. Upon the death of his first wife he married Julia Ohrndorf Brügerhoff on Oct. 22, 1863.They would have nine children - Albert, Edward, Hugo, Julius, Adolf, Nono, Henrietta, Alvina and Clara. In 1864 he moved to Bastrop, where he taught at the Orgains School. After the Civil War he became chief justice of Bastrop County. Judge Schuetze served in the 12th Texas Legislature from Feb. 9, 1870, to Jan. 14, 1873, as a federal tax collector and was an Indian agent with a tribe in Colorado. He was a Republican (Radical Party) and worked actively against prohibition. From 1870 to 1873 he and O.H. Dietzel published Texas Vorwärts (Forward), a German-language newspaper, first in New Braunfels, and in 1883 Schuetze published Wochenblatt in Austin. Like his father, who had been a silk grower in Germany, Schuetze raised silkworms, which he exhibited and took first prize with at the State Fair of Texas. 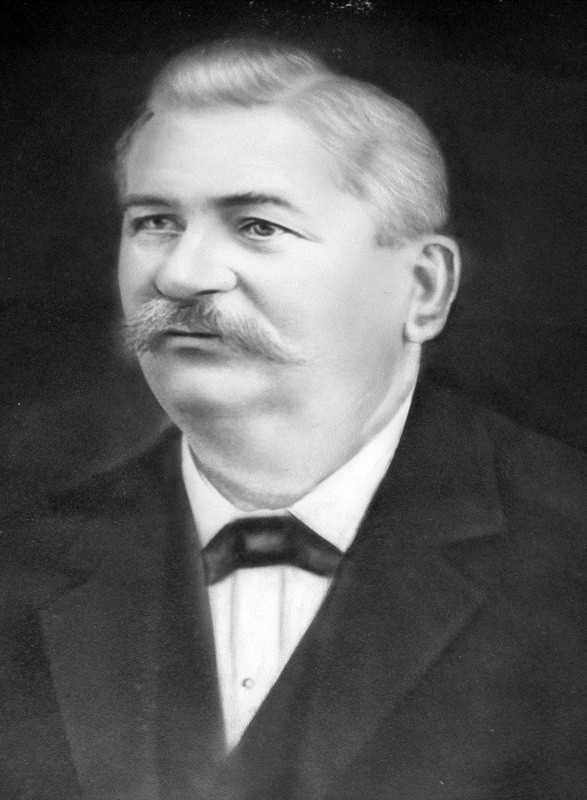 His article "Seidenbau in Texas" ("Silk Farming in Texas") was published in the Jahrbuch für Texas in 1884. He also was director of the Austin Sängerbund.Schuetze was active in the Order of the Sons of Hermann, which he served as Grand President from 1891-1892 and again from 1893-1897, and as National President from September 1897 until his death. He died in Austin on April 23, 1904, and is buried in Oakwood Cemetery in Austin. Schuetze’s diary can be found in the Victoria College Regional Library Archives and The Schuetze Family Papers in the Austin History Center of the Austin Public Library. Friedrich Klopp was born in November 1849 in Germany.He and his wife, Wilhelmina Welle (born in August 1854), married in 1875 and had five children - Emma F. (born Feb. 20, 1876), Friedrich Jr. (born Feb. 10, 1878), Minna L. (born Dec. 14, 1880), Bertha F. (born Dec. 22, 1884), and Martha F. (born March 1886). The family immigrated to Texas in 1884 and Friedrich worked as a traveling liquor salesman. They lived in Denison in Grayson County. Friedrich served as Grand President from 1892-1893. He was a member of Wartburg Lodge No. 62 in Denison where he served as a trustee from 1896-1897 and secretary in 1907. His daughter, Emma, would serve as secretary of Fuerstin Bismarck Lodge No. 6 from 1901-1902. Friedrich died Dec. 3, 1920, and Wilhelmina died in 1929.Their family plot in Fairview Cemetery in Denison is shared with daughter Emma (who died June 1, 1970), daughter Minna (who died Dec. 22, 1974) and her husband Herbert Y. Parrott, daughter Bertha (who died March 15, 1971) and husband Mike R. Fewell, and Martha F. (who died Dec. 13, 1973) and her husband Walter H. Meek.Son Friedrich Jr., (who died Sept. 25, 1944) is buried with his wife, Claribel Easterwood, in Hearne Norwood Cemetery in Robertson County. Carl F. Altermann was born Nov. 4, 1855, in Leipzig, Sachsen, Germany, and was an American citizen by adoption.When he was a lad of 11, his parents emigrated from the fatherland to the United States and located in New Orleans.The parents soon after died in that city and Charles was left to his own resources.He was apprenticed to learn the printer’s trade in Mobile, Alabama, and when he had served out his time he went to New Orleans and worked on the Gazette for a while.In 1874 he came to Texas, and had not been in the state long before he located in Dallas, and established the Texas Volksblatt.He edited this sheet from 1877 to 1889, when he sold it to the Texas Post. The Volksblatt had a daily and weekly edition, and was considered the best representative of German sentiment in the South. He was the editor and proprietor of the Norde Texas Presse (which began publishing in 1892), a new paper started by the German citizens of Dallas, upon the withdrawal of the Texas Post to Galveston. On retiring from the field of journalism, Altermann engaged in the real estate business, but still retained an interest in public affairs.He was president of the Maifest, a German May-day festival, and under his energetic management it was a brilliant success.Politically he affiliated with the Republican Party, which sent him to their national convention at Chicago in 1888 and he was candid and open in the expression of his sentiments without being intensely partisan.He was a member of the Turnverein, the singing society (Frohsinn), the Knights of Honor and the Sons of Hermann where he served as Grand President from 1897-1903. In 1880 he married Louise Schultz (born in Germany), of Houston, and six children were born to them. He died on Nov. 13, 1913, and is buried in the Greenwood Cemetery in Dallas.Hermann Sons provided the monument over his grave and dedicated it in a ceremony on Nov. 24, 1916, which all Grand Lodge officers attended. Friedrich Johann Hofheinz was born April 29, 1840, in Steinbrucken, Nassau, Germany.He immigrated from Bremerhafen to Hortontown (near New Braunfels) with his parents and younger siblings in 1851 when he was 11.His family’s departure from Germany marked the end of his formal education.Unfortunately, his father died in the cholera epidemic of 1852, a few months after their grueling, nine-day voyage and arrival through the port of Indianola.The family was destitute.Friedrich went to work as a teamster hauling freight from the coast into the interior from 1854, when he was 14, until he was 22. 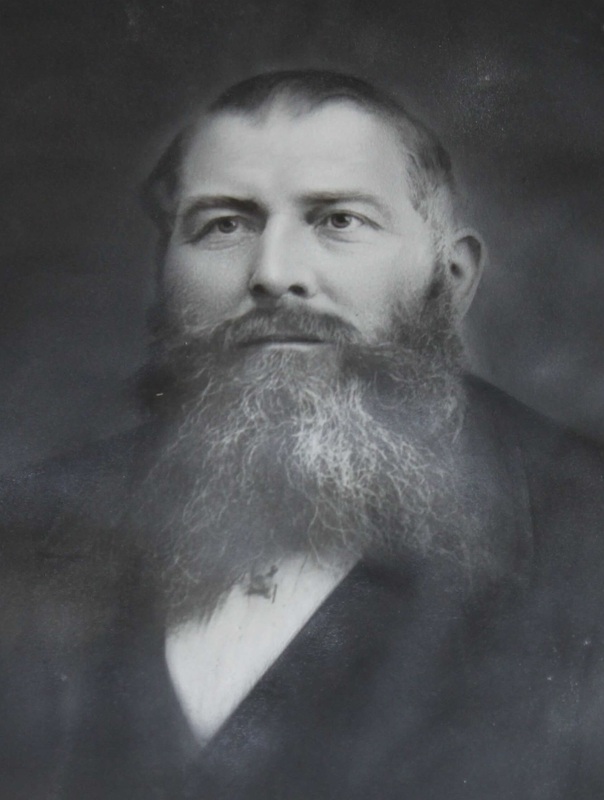 In 1862 he moved to Kendall County and joined the volunteers who under the direction of Captain E. Jones guarded the frontier from Indian attack.Two years later, on Sept. 18, 1864, he married Emilie Wilke and started farming and ranching in the area. They raised seven children.Emilie had been born on May 29, 1843, in Port Lavaca, not long after her parents’ ship docked.She spent her early childhood in Port Lavaca and her teens in Kendall County, where she met Friedrich.Friedrich was a popular local official, regularly elected justice of the peace and county commissioner.When he decided against running for re-election, the voters elected him anyway, but he refused the office. He was active in the Order of the Sons of Hermann, holding the offices of Grand Finance Committee member, Grand Trustee, First Vice President, and in 1903 was elected Grand President.His term was so successful that he was re-elected to another term without opposition in 1905.His two terms were characterized by a marked increase in both new lodges and total membership. 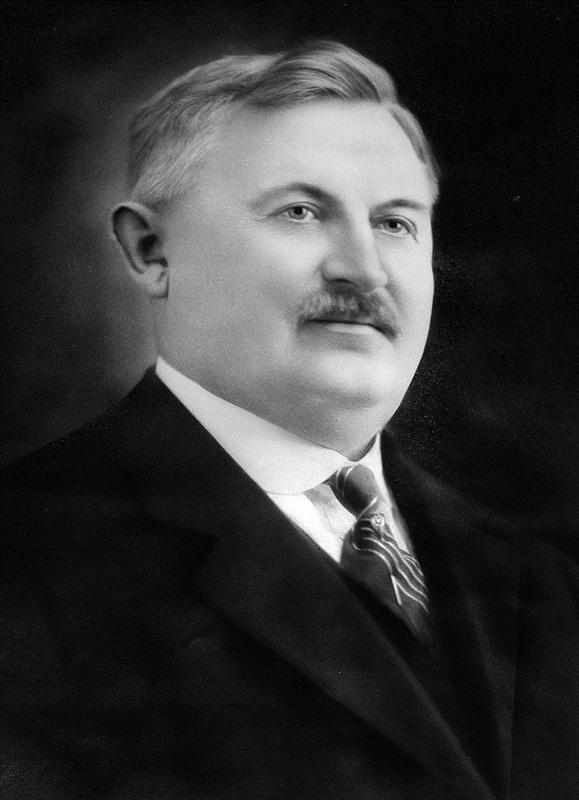 In 1905, Friedrich turned the management of his ranch over to his youngest son and moved to New Braunfels.In 1908 he became one of the principal founders of the New Braunfels State Bank.He was elected president and director of the bank and was re-elected every year until he retired in 1911. Hofheinz died at home of complications following an operation for liver cancer on April 21, 1918.Emilie died on Dec. 20, 1919, from a stroke following an earlier heart attack.They are buried in Comal Cemetery in New Braunfels.Their headstones include porcelain portraits of both Emilie and Friedrich. The Hofheinz House still stands at 548 Hill St. in New Braunfels. 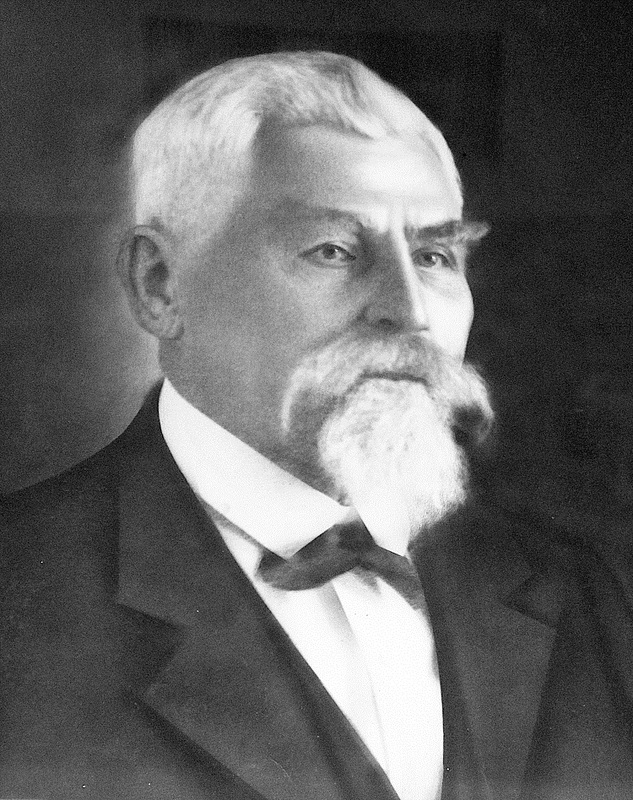 Wilhelm “William” Oldenburg was born in Holstein, Germany, Feb. 11, 1844. He was reared and learned the trade of cigar maker in Hamburg. In 1866 Mr. Oldenburg married Caroline Bleuse in Hamburg, Germany. Caroline was born in May 1848 in Cassel, Germany. They sailed from Hamburg in August of 1867 and arrived in Galveston on Nov. 1 of that same year. They made their home in Navasota with Wilhelm’s sister (Mrs. Ahrenbeck) for a short time, but in December of the same year relocated to Galveston, where William secured work in his trade. In 1872 he joined the Galveston Volunteer Fire Department, and held various positions in that organization for the next 12 years. He was the chief during the years 1879-80 and 1883-84. He was among the first to discuss the possibility of organizing a paid fire department. While connected with that department of the city he did much to promote the efficiency of the same, and at all times enjoyed great popularity, both with the men over whom he ranked and with the public at large. In 1891 Mr. Oldenburg was made superintendent of the city waterworks, the duties of which he discharged with his customary fidelity. He lived through the Galveston Hurricane of 1900. He was a member of the Odd Fellows, the Knights of Pythias, Chosen Friends, the Galveston Turn Verein, the German Workingman's Benevolent Society and the Galveston Mænnerchor. In several of these societies he held official positions. Wilhelm and Caroline had one daughter and four sons. The daughter, Helena (born 1869), married George H. Nichols, and the sons are William (born 1872), John J. (born Sept. 6, 1874, died Jan. 25, 1951), Albert (born October 1876) and Paul (born May 1881). According to a 1900 census, John and Albert worked as electric linemen and Paul followed in his father’s footsteps working as a tobacconist. He was a member of Hermann Sons Gulf Lodge No. 46 and was Grand President of the Sons of Hermann from 1907-1908. Wilhelm died Aug. 31, 1908, in Galveston. Caroline died Jan. 23, 1924. They are both buried in Evergreen Cemetery in Galveston. His name would be immortalized in Laubach when William Oldenburg Lodge No. 244 was chartered Jan. 24, 1909. Carl Johannes von Rosenberg was born Feb. 4, 1857, in Evergreen, Washington County, Texas, to Johannes Carl von Rosenberg and Julia Wilhelmine Christine Groos. He was baptized on Easter Sunday, March 29, 1857, by Lutheran Pastor Otto Haun at the home of his Grandfather Groos in Round Top. On Sept. 30, 1884, in Ellinger, he married Dorothea Elisabeth Charlotte Meyer (born Feb. 17, 1866 in Ross Prairie, Fayette; died March 28, 1937 in Austin). They had four children – Eleanor Anna, Dorothea Hulda, Laura Ida and Julia Lena. In his youth he was a clerk and mill worker. Later he was a merchant. The von Rosenberg-Heintze Company, a general merchandise store, was formed in 1903. He was on the board of directors for Farmers Lumber Company of La Grange in 1907. C.J. von Rosenberg was a member of the Texas House of Representatives of the 29th Legislature representing District 57 (Fayette County) and served from Jan. 10, 1905, to Jan. 8, 1907. He was again elected to the 31st Legislature from Jan. 12, 1909, to Jan. 10, 1911. He was a Democrat. 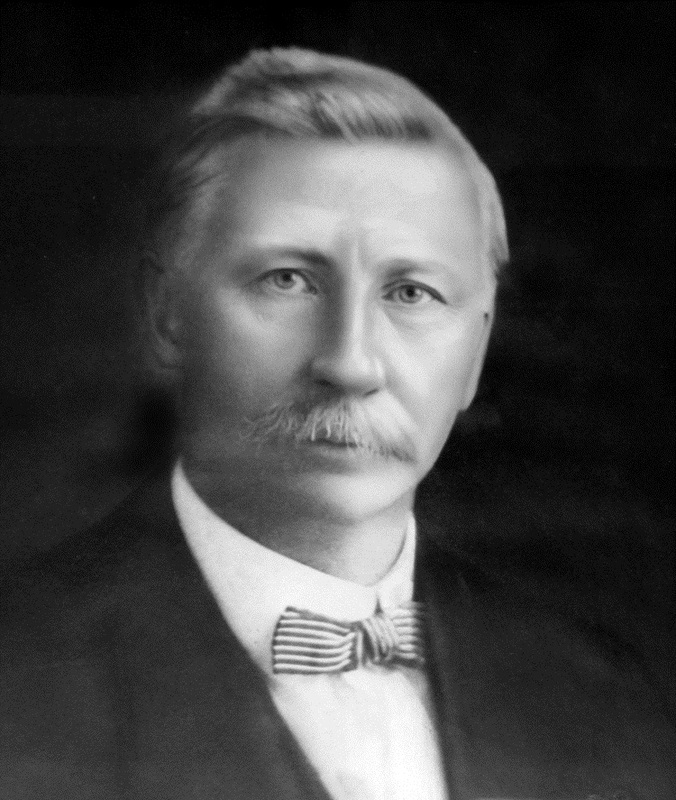 He served as Grand President from 1908-1913 and was the first U.S. born Grand President of Hermann Sons. 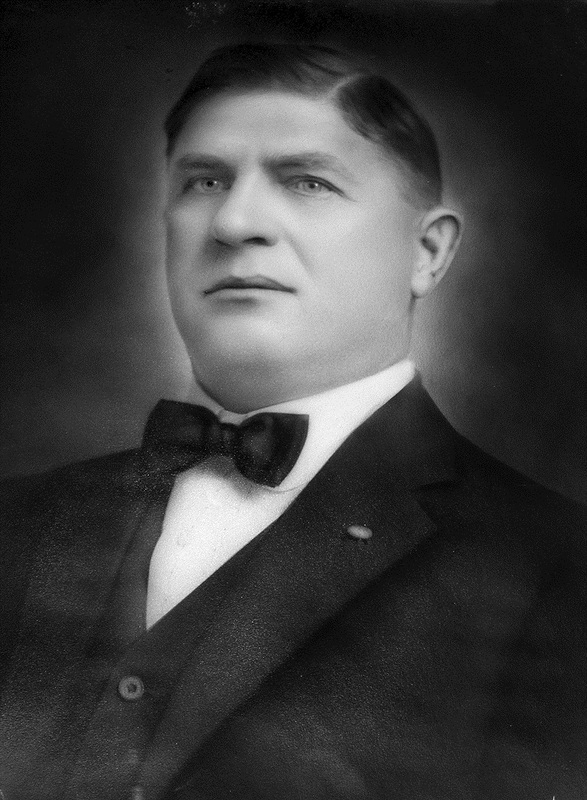 He also served as National Grand President from 1913-1918. It was during his tenure that the San Antonio lodges joined together to build their own hall which is now the Hermann Sons Home Association Building. A portion of the building served as the Grand Lodge headquarters until 1950. C.J. died of pneumonia on July 20, 1934 at his residence (710 West 21st) in Austin and is buried in La Grange Cemetery with his wife. In 1911, what is known today as the Hermann Sons Life Home Association Building was erected and housed the home office and local lodges until the Grand Lodge offices moved to the current location in 1950. It was during the Grand Lodge Convention in Austin on April 21-23, 1913, that Grand Secretary John Windlinger made the recommendation to build a retirement home to provide security and community for our elderly members. It is believed that this was the first time that any fraternal group had proposed such a project. It would be called the Alten und Waisenheim (elder and orphan home). The resolution was adopted and a committee of 10 members – five from rural areas and five from cities – were appointed to select a site. After looking at places in La Grange, San Marcos, San Antonio, Fredericksburg, Austin and Boerne, the committee chose 202 acres on a hilltop near Comfort overlooking the Guadalupe River. It is no doubt that their decision was influenced by the fact that $7,000 of the $9,000 cost was donated by the Hermann Sons Life lodges and citizens of Comfort. August Von Haxthausen Sr. was born June 4, 1874, in Hoexter, Westphalia, Germany, to Marcel Wilhelm and Isabella Kneip Haxthausen. He had one sister and five brothers. He married Minna Spanuth (1871-1952) and they had three children (Mamie E., John Joseph and Werner). He was a member of the Houston Sängerbund. Haxthausen represented District 24 (Harris County) in the 31st and 32nd Texas Legislatures as a member of the House of Representatives from Jan. 12, 1909, to Jan. 14, 1913; and represented District 15 (also Harris County) in the 33rd and 34th Texas Legislatures from Jan. 14, 1913, to Jan. 9, 1917. He was a Democrat. He was involved in the fight against prohibition. He was appointed Lieutenant Colonel Aide-de-Camp by Governor James E. Ferguson. He served as Grand President from 1913 to 1917 and was the youngest to be elected to the office at age 38. It was during the convention where he was first elected that a resolution was adopted to construct a Home for the Aged which opened during his term of office in 1916. At the dedication of the Altenheim, Haxthausen and Texas Governor James E. Ferguson were the principle speakers. In later life he was a farmer. August died July 7, 1931, in Houston. He is buried at Saint Peters United Church of Christ Cemetery in Spring Branch. The formal dedication of the Retirement Home was held Thursday, May 11, 1916. Local Hermann Sons Life members and Comfort citizens planned every detail including special train fares to San Antonio from all points in Texas with connections to Comfort. On the morning of the dedication, many of the estimated 6,500 visitors were met for a reception at the railroad station in Comfort. Guests were transported by service cars and local citizens to a grove on the river just below the Home. A 100-foot trench was dug the day before and 30 head of cattle roasted for the feast which would include potato salad, pickles and bread. Beer was also furnished. Bands played at the river grove until 1:30 p.m. when everyone walked up the hill to the Home for the official dedication. The dedication ceremony was marked with speeches in English and German. The Texas Grand President, August Haxthausen, delivered an official address as did the then Governor of Texas, James E. Ferguson. Guests took tours of the Home before returning to Comfort for a night of grand balls and open air concerts. The Alten und Waisenheim would only be offered to orphans for a few years and then would simply be known as the Altenheim. When the English language became more widely used it was referred to as the Home for the Aged. Today it is called the Hermann Sons Life-Retirement Home. Julius M. Schramm was born in Oldenburg, Holstein, Germany, on Aug. 15, 1868. He immigrated to the United States in 1886 where he first lived in Austin after a stay in New York. Later he moved to Taylor and then Granger where he established himself as a successful businessman. He married Lina Mingren (born March 2, 1872, in Sweden; died Sept. 21, 1962). They had five children - Mrs. George Jacobs, Katherine Kutzbach, Hugo, Fritz and Julius Jr. He was a charter member of Cleveland Lodge No. 3 (now Taylor Lodge) on Feb. 7, 1890. Later he transferred to Schleswig Holstein Lodge No. 202 in Granger where he lived. He was instrumental in chartering this lodge. When Lodge No. 202 was dissolved, he joined the membership of Schwertner Lodge No. 307. He also was a member of the Improved Order of Redmen. Schramm served the Grand Lodge as Grand Outer Guard and Grand Inner Guard. He served as Grand Trustee under Grand President Rosenberg. And at the convention held in Waco in April of 1917 he was elected Grand President. He served in that capacity for 10 years. He died Feb. 10, 1962, and is buried at the Granger Brethren Church Cemetery. We were called the Sons of Hermann because when Hermann Sons Life was first formed it was an organization for German men only. Men’s organizations were quite common. The woman’s place was in the home caring for the family. But the time would come when Hermann Sons Life women wanted more. In fraternal orders an auxiliary is typically a female or "sister" club for all-male organizations. These groups have historically served to remove wives’ objections that their husbands are away with a group that excludes them and it often creates a free labor pool for administrative and organizing affairs. The first sister lodge of Hermann Sons was established in Sherman in August 1896. More sister lodges followed until the concept of joining men and women together in one lodge was introduced. On March 1, 1920, during the height of women’s suffrage in the U.S., the first mixed lodge, having both men and women members, Pershing Lodge No. 160, was established in San Antonio. Women would now have an equal voice in Hermann Sons business for the first time. In the years to follow, men’s and women’s lodges would merge together to form mixed lodges. Today the only men’s lodges remaining are Harmonia and Hondo. The only women’s lodges are Louise Schuetze, Vineta and Hondo Victory. Fritz George Schilo Sr. was the son of Fritz Schilo and Caroline Hasselbach of Germany. He was born May 23, 1874, in Biebrich, Germany. He married Augusta R. Donnerberg (1879-1908) on Aug. 16, 1901. They lived in Floresville and had three children (Hilda, Fritz Jr. and Clara). Augusta died on Clara’s second birthday and is buried in an unknown location in Wilson County. He moved to Beeville and started Schilo’s saloon. Fritz married Laura Krueger (1886-1970) on Jan. 19, 1910, in Bee County and they had two children (Elsie and Edgar). In 1914 he moved the family and the business to Commerce Street in San Antonio. Prohibition came in 1917 and the saloon closed. That same year, Schilo’s Delicatessen opened at the corner of South Alamo and Worth streets, with fare much the same as it is today. Mrs. Schilo spent weekends preparing food and special treats from her own recipes. In 1927 Schilo’s moved again to Commerce Street – next door to its present location. Christmas German-style was the best time of the year and Schilo’s shared it with all through their window decorations and a hot cup of split pea soup. Shilo also was the president or vice president of a bank and a savings and loan. He was the founder of the Beethoven Maennerchor and the Beethoven Hall and Garden in San Antonio. At the time of his death, Schilo was the Grand President of the Sons of Hermann in Texas. Fritz was instrumental in obtaining a license for the Sons of Hermann in Texas to become a fraternal insurance company. Schilo died Sept. 3, 1935, and is buried at San Jose Burial Park in San Antonio. George John Haeusler was born Jan. 10, 1871, in Industry, Texas. He was the son of John and Johanna (Brehan) Haeusler. After completing high school, he enrolled as a student at Blinn College in Brenham from where he graduated. For the next 20 years he taught school in various communities in Fayette County. He took a deep interest in the welfare of the communities where he taught and the youth in his care. On Oct. 30, 1892, he married Ida Marquart (who was born in Germany on March 14, 1877). They made their first home in Round Top. They raised six children (three sons and three daughters) - Lee, Edwin, Anita, Leslie, Ruby and Leota. the Deutsche Zietung, and was editor and publisher for the next several years. His interest for the community and his readiness to serve was apparent through his relationship with the Lutheran Church and his appointment as county auditor of Fayette County. He was a director of the Fayette County Fair Association and friends with Past Grand President Von Rosenberg. He became a member of Round Top Lodge No. 151 in 1896. In 1913, he transferred to Bismark Lodge No. 8 in La Grange. He became affiliated as an officer with the Grand Lodge in 1911 and in September of 1935 was called upon to fill the unexpired term of Grand President Fritz Schilo Jr. who died in office. 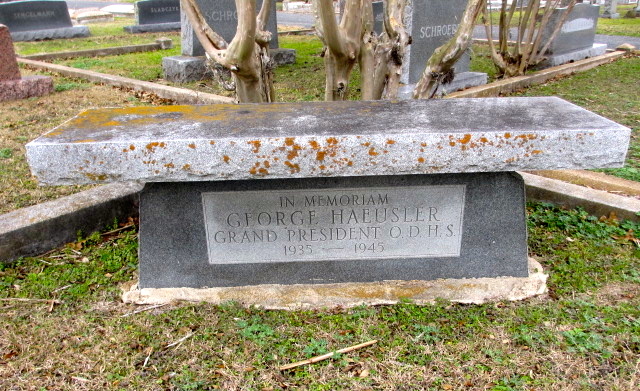 He served as Hermann Sons Grand President from 1935 until his death on June 26, 1945, in San Antonio. He is buried in La Grange Cemetery. His gravestone, census records and newspaper articles spell his last name “Hausler.” He was preceded in death by his wife Ida and daughter Ruby. The Grand Lodge erected a memorial bench on his gravesite. At the 1936 Grand Lodge Convention, delegates adopted a proposal to publish the Hermann Sons News in the English language. Carl Biebers was appointed to direct membership efforts. The addition of junior life insurance would make Hermann Sons Life a true family organization. The first junior certificate was written for Robert William Lange on Sept. 15, 1942. Hermann Sons Life introduced the 20-year pay whole life certificate. Certificate No. 1 was issued to Harry A. Nass Jr. on Sept. 1, 1945. Chris Herry was born April 22, 1881, in New York, N.Y. His father was born in Germany and his mother in Switzerland. He was married to Louise C. (born May 18, 1888; died Jan. 11, 1983). They had seven sons - Chris, Benjamin, Roland, Herbert, Marvin, Eugene and Robert - all of whom were born in Texas. In a 1920 census he listed his profession as secretary-treasurer of the New Braunfels Brewing Company. His oldest son, Chris Otto, also worked there as a bottler. 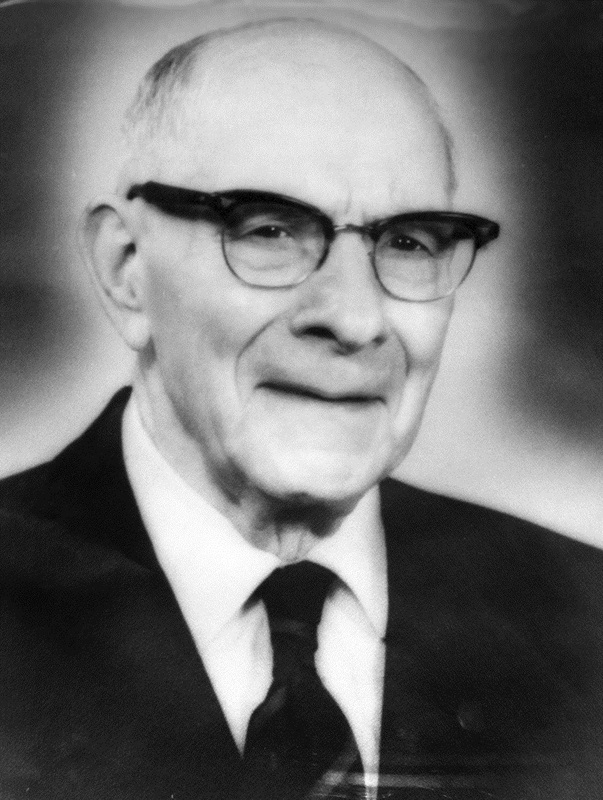 He served as president of Gemischter Chor Harmonie (a German singing society) from 1937-1959. He was a member of Teutonia Lodge No. 21 in New Braunfels and served as their secretary for many years. 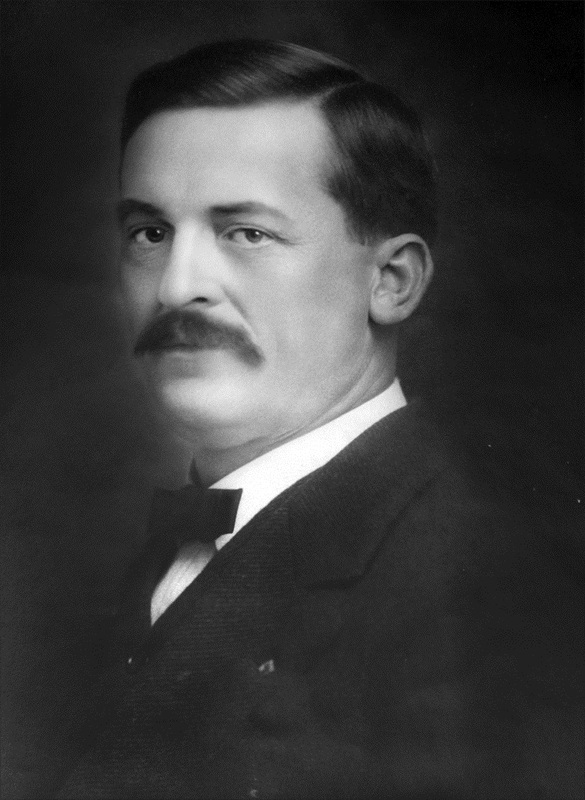 Serving as First Grand Vice President, he became Grand President of Hermann Sons upon the death of George Haeusler in 1945 and served until the completion of the term in 1946. He was defeated in his bid for re-election at the 28th Grand Lodge Convention by Carl Biebers. He died April 5, 1960, after a long illness. He and his wife are buried in Guadalupe Valley Memorial Park in Seguin. Chris Herry’s son, Robert Lee, died Aug. 31, 1943, while serving his country in World War II. He was a captain in the U.S. Army Air Force. He received the Purple Heart Air Medal. His name is engraved on a plaque that hangs in the Home Office. Carl Biebers was born in Bremen, Germany, on Aug. 27, 1887. He immigrated to the United States in 1911, and after receiving his American citizenship, became a captain in the 36th Infantry Division of the Texas National Guard. He married Littleton M. Griesenbeck in 1914. He joined the Hermann Sons Life Lodge in Lockhart on April 2, 1916, and worked as a wholesale cotton merchant. They had three children - Carl (born 1920), Annette (born 1923) and Katherine (born 1924). Sometime before 1930 he and Littleton moved to San Antonio, divorced and he transferred his membership to Harmonia Lodge No. 1. 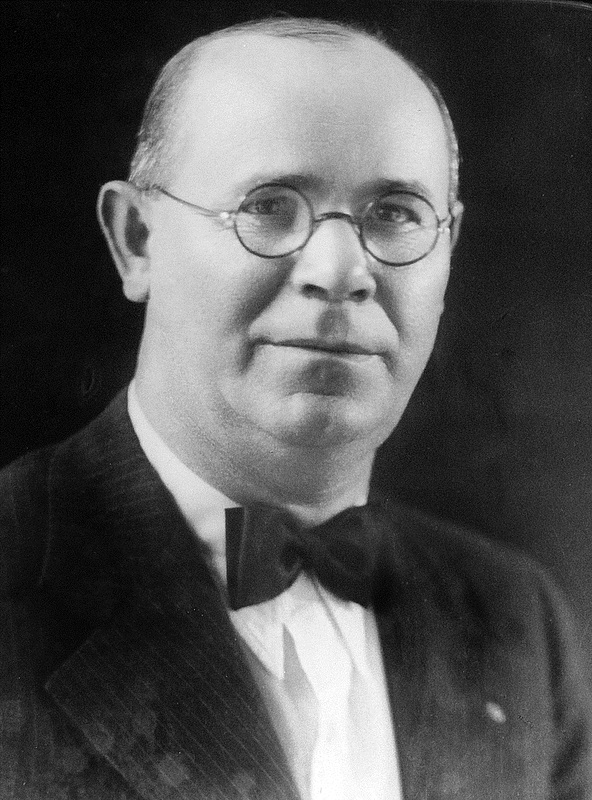 He served as lodge president from 1935-37. A 1940 census shows him living in Olmos Park, San Antonio, married to Anna Marie (born 1890), and employed as a field supervisor with Hermann Sons Life. He was elected Second Grand Vice President in 1935 and First Grand Vice President in 1945. He was elected Grand President at the convention of 1946 for the first of his successive three-year terms. Under his leadership Hermann Sons instituted a highly successful membership development program which nearly tripled membership during his tenure. Brother Biebers instituted the statewide youth activities program for juniors that included our Schools of Dance and Youth Camp. He is widely remembered as the “Father of the Hermann Sons Life Youth Movement.” The first building constructed at the Youth Camp is named in his honor. Biebers was a member of Christ Episcopal Church, Woodmen of the World, the Beethoven Maennechor, Bexar Bowling Club, Alzafar Shrine and Perfect Union Lodge. He served on the boards for the Fiesta San Jacinto Association, Lions Club of San Antonio, Salvation Army, Alamo Motor Club and Welcome Home for the Blind. Brother Biebers died Nov. 26, 1971, and is buried in Sunset Memorial Park in San Antonio. The Grand Lodge offices moved to 515 S. St. Mary’s Street. The Hermann Sons Life-Camp was dedicated on Aug. 15, 1954. That summer some 200 campers participated in its inaugural season. It is believed to have been the first large camp in Texas to have air-conditioned dormitories. There was only the one building (known today as Carl Biebers Hall) that first year. There were two dormitories upstairs which accommodated 64 campers and the dining hall and kitchen were on the first floor. The swimming pool wasn’t constructed until the next year. Children would be taken in a brown van nicknamed “Leaping Lena” to a pool in Comfort that a resident of the town had built for his child who was stricken with polio. Fritz Schilo Jr. was born March 20, 1903, in Wilson County. His parents were Past Grand President Fritz G. Schilo Sr. and Augusta R. Donnerberg Schilo. Early in his adult life he worked for Pioneer Flour Mills, Jones & Laughlin Steel Corporation, and the San Antonio City Public Service Board. 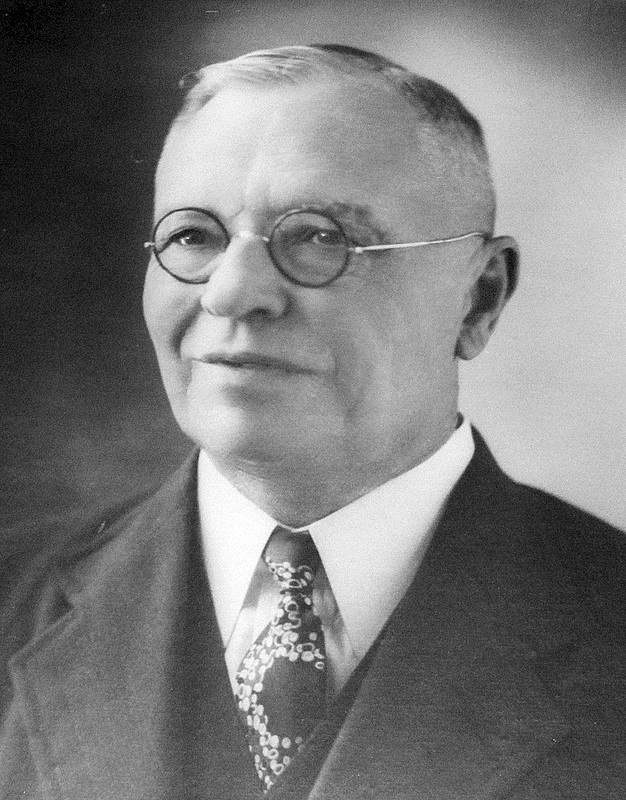 He was head of the City-County-State Sanitation Division in San Antonio from 1930 to 1950, prior to working full-time as recording secretary of Harmonia Lodge No. 1 where he had been a member since 1920. He served on the Grand Lodge Youth Activities Committee for several years prior to winning election as Grand Secretary-Treasurer in 1955. He was elected Grand President in 1958 and three more times serving 12½ years, longer than any other Grand President at that time. Schilo served as president of Harmonia Lodge No. 1, president of the San Antonio Home Association and president of the Hermann Sons Carnival Association. He was a member of the San Antonio Presidents and Vice Presidents Council and the San Antonio Hermann Sons Mixed Chorus. He was also a member of the Beethoven Maennerchor and served on the Bexar County School Board. Fritz never married and did not have any children. He died Dec. 21, 1970, unexpectedly in his sleep at his home in San Antonio and is buried in San Jose Burial Park. His father also died in office. Heinrich “Henry” O. Riemer was born in Berlin, Germany, in 1906 and at age 21 immigrated to the United States. He started work for the San Jose and South San Antonio Water Companies as a ditch digger making $12 a week. He would eventually work his way up the ladder to general manager. He joined Siemering Lodge No. 32 in 1927 and also served as a director and secretary for the San Antonio Hermann Sons Home Association and vice president and secretary for the San Antonio Hermann Sons Carnival Association. He was also active in the Beethoven Maennerchor and the Austrian-Hungarian Society. According to a 1930 census he lived with his brother, Ernst, in Bexar County where he was a bookkeeper for the water company. He married Johanna (1914-2005) and they had a daughter, Christa Margarete Espach (born 1934), and a son Henry Riemer Jr. (born 1936). 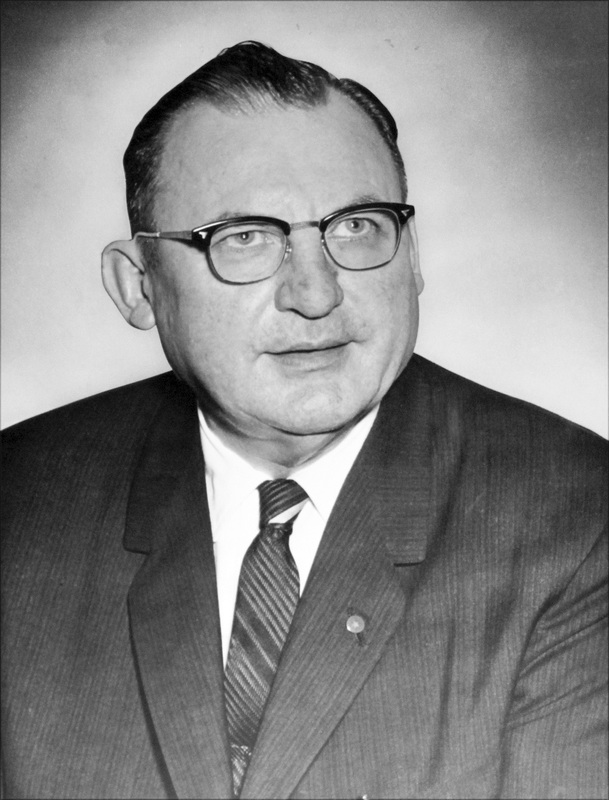 He was first elected First Grand Vice President in 1958 and continued to be elected into that office until he became Grand President on Dec. 21, 1970, with the passing of Grand President Fritz Schilo Jr. He served as Grand President from 1970-1977. He will be remembered through history as the Grand President who modernized recordkeeping at the Grand Lodge. Our Order was one of the first fraternal benefit societies of its size to computerize recordkeeping. 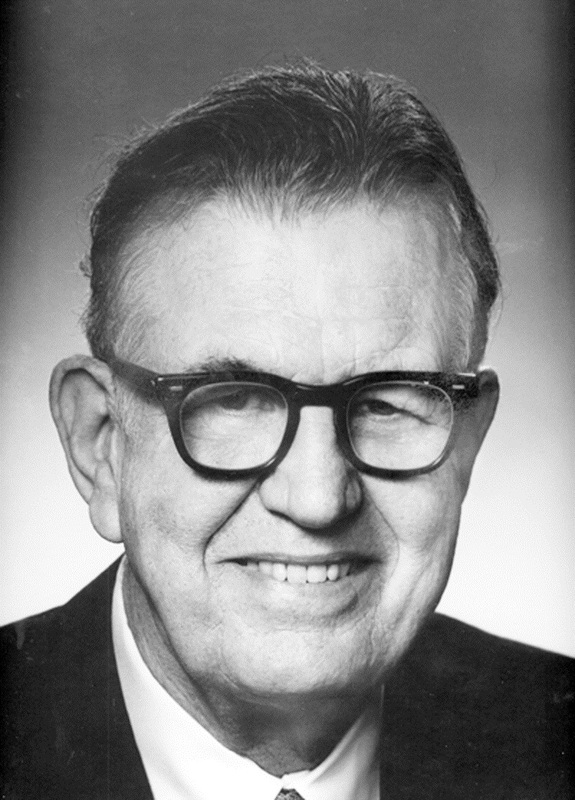 Brother Riemer died Nov. 3, 1985, in San Antonio and is buried in Sunset Memorial Park in San Antonio. Louis Benno Engelke was born in Galveston on Sept. 3, 1917, to Charles and Rowena Engelke. Louis graduated from The University of Texas with a degree in journalism in 1941. He wrote and edited for the Galveston News and San Antonio Express-News until entering the U.S. Army in 1942. He served as an MP in Patton’s 80th Division in World War II, sailing for England on D-Day and earned the Bronze Star. Louis retired in 1977 with the rank of colonel. Louis is remembered for his public relations work and his commitment to the community. Following World War II, Louis returned to the San Antonio Express-News and then began a career in public relations. 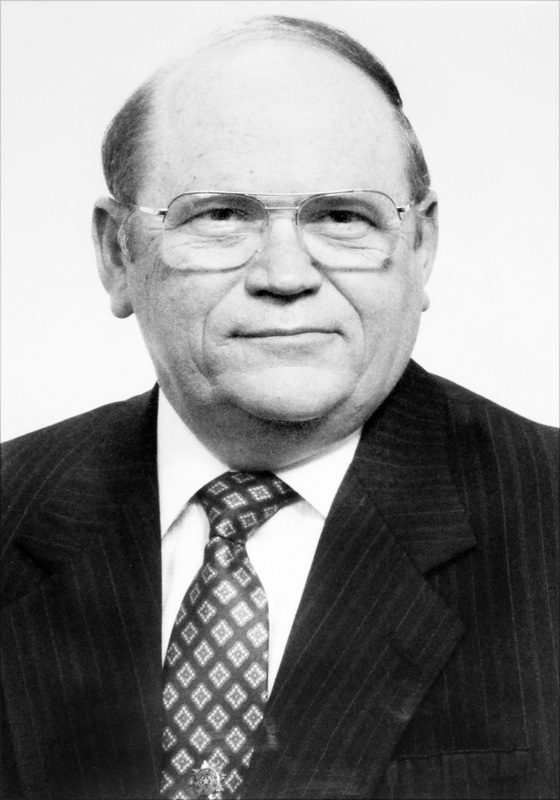 Blessed with energy and enthusiasm, he served as Grand President of the Sons of Hermann from 1977 to 1989, president of the National Fraternal Congress of America and president of the Texas Fraternal Congress. He was responsible for the inception of Hermann’s Happiness, a popular Fiesta event. Louis was a member of Harmonia Lodge No. 1 and on the Salvation Army Advisory Board, Order of the Cascaron, Fiesta San Antonio Commission, American Legion, Founders Lions Club, San Antonio Chamber of Commerce, 80th Division Veterans Association, Monday Morning Quarterback Club and Sigma Delta Chi. 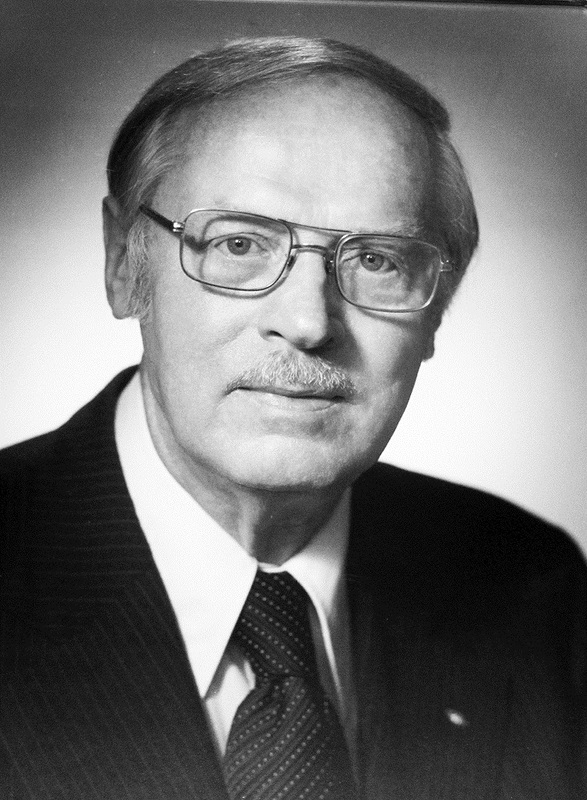 Brother Engelke died June 1, 2004. He was married for 61 years to Maxine. They have a daughter, Roni Engelke. Leroy Paul Muehlstein was born in Moulton on Aug. 20, 1936, to Emil Tom Muehlstein and Matilda Dierschke and was raised on the family farm. His parents and grandfather were members of Moulton Lodge. After high school, he came to San Antonio to attend business college were he studied bookkeeping. He graduated with an associate’s degree in 1954. He also studied economics at San Antonio College. He worked at Handy Andy and the meat department at H-E-B. He also worked for City Public Service from 1955-1968, Texas Travelers and served in the Army Reserves. He married Linda Merle Breitschoef on May 4, 1957. They have three children, Scott, Glen and Robert, and nine grandchildren. H.F. Koester and Ike Neimeyer encouraged him to join Hermann Sons and he became a member of Harmonia Lodge in 1955. He transferred to Kirby Lodge in 1964 and served as president of that lodge for seven years starting in 1967. He served as a Hermann Sons agent for almost two decades. He first became a Grand Lodge officer in 1973 when he was elected to the Grand Finance Committee. He would also serve as Second Grand Vice President and First Grand Vice President before being elected Grand President in 1989. He would serve until 2009, making him the longest serving Grand President to date. During his tenure the Grand Lodge governance system was changed and the use of the password and salutation sign was discontinued. He also served on the state and national level including a year as president of the National Fraternal Congress of America in 2000-2001 and a year as president of the Texas Fraternal Congress in 2006-2007. He is a past president of the Optimist Club, a member of the San Antonio Executives Association and a member of the board of directors for Boysville. In his retirement, he remains an active member of Hermann Sons Life. Hermann Sons Life-Camp opened a second facility, Hilltop, so more children could be accommodated during the summers. Stephen Royce Prewitt was born Feb. 8, 1948, in San Antonio to Walter E. and Katherine Pirkle Prewitt. He is a graduate of Highlands High School in San Antonio and received a bachelor of business administration degree in personnel management from St. Mary’s University. He married Julie Krueger of San Antonio on Jan. 18, 1969. They have two children, Robert and Kelsie, and two grandchildren. Brother Prewitt has one brother and one sister. He served as a 2nd Lieutenant in a U.S. Army field artillery unit from 1972-1974 and later joined the National Guard. His work experience prior to joining Hermann Sons included a part-time job at the post office. He also was a district agent for Lutheran Mutual, a commercial insurance company. Looking for other opportunities he found Hermann Sons and was hired as a special representative. Initiated by James Wicker, he joined Harmonia Lodge No. 1 in December 1975 and has been a member of that lodge ever since. He served as the lodge’s agent and was elected financial secretary of the lodge in 1978. He was elected Grand Lodge Trustee in 1981 and served in that capacity until 1997 when he was elected Grand Vice President-Investments. He served in that position until 2009 when he was elected Grand President/CEO. He served one term and retired in 2013. During his time as Grand Vice President, a new investment procedure and laws were adopted. His other Hermann Sons involvement over the years included serving on the Carnival Association, the Junior Picnic Committee and the Hermann’s Happiness Committee. He was president of the San Antonio Home Association and a member of the Presidents’ Council. He is an active member of his church and he and wife Julie are Meals on Wheels volunteers. Allan Wayne “Buddy” Preuss was born on Oct. 2, 1958, in Seguin to Billy and Mary Lou Preuss. He became a member of Hermann Sons Life-Stern in Geronimo on Oct. 20, 1960. He received a bachelor of science degree in recreation management from Texas State University in 1981. He is married to Elizabeth Preuss of Monahans. Together they have six children and numerous grandchildren. As a young man he attended lodge meetings with his grandfather, Marvin John Preuss, who encouraged him to apply for a job at Hermann Sons Life-Camp in 1978 where he would work seasonally until hired full-time. In 1990 he transferred to Hermann Sons Life-Siemering where he moved through various officer positions and was president in 1994. His Hermann Sons Life employment included serving as Youth Activities Coordinator from 1981-1985, Executive Camp Director from 1985-2009 and Vice President of Marketing from 2009-2013. While Executive Director, he took Camp through the process of becoming accredited with the American Camp Association, he created and implemented the Counselor-in-Training program and he instituted a staff development program. With the American Camp Association, Buddy served on the Texoma Section board of directors from 1991-1996 including a term as president from 1994-1995. He also served on the ACA National Program Committee from 1994-1995. 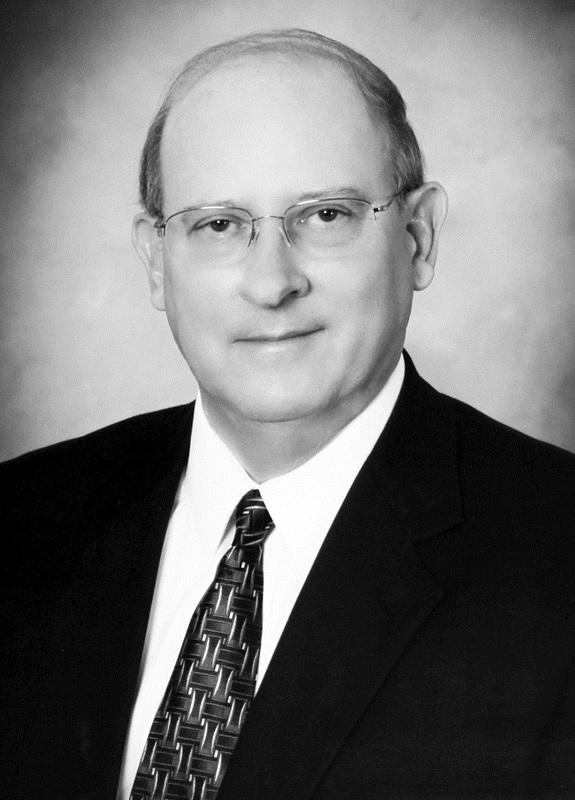 He served on the board of directors for the Texas Fraternal Alliance from 1987-1997 and was president from 1995-1996. He was elected to the American Fraternal Alliance’s board of directors in 2016 and served on the President’s Section Advisory Council from 2014-2016 and the Non-Dues Revenue Task Force from 2014-2016. He has been a speaker and presenter for many professional organizations. He is an active member of Hermann Sons Life-Comfort where he served as president from 1999-2005. During his time as Grand Vice President-Marketing, he instituted a new agent training program, agent manual and continuing education. 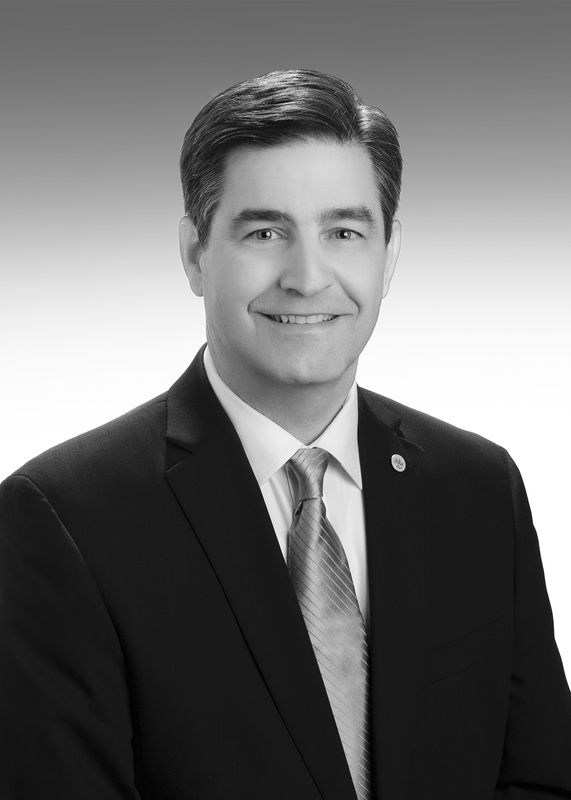 As Grand President and CEO, his accomplishments so far include emphasizing member and prospective member engagement, instituting an enterprise risk management program, implementation of leadership summits for ambassadors, a regular continuing education program for Home Office employees and development and implementation of new branding and leadership through suggested governance changes for approval at the next Grand Lodge Convention.